This entry was posted on Tuesday, September 11th, 2018 at 12:08 pm. WESTBURY Lions, in collaboration with Trowbridge Lions, celebrated as their first White Horse Classic & Vintage Vehicle Show raised over £6,000 for local community projects. Around 300 vintage vehicles took part in the event at the White Horse Country Park, along with live entertainment, stalls and a funfair. Nigel Coward, president of Westbury Lions said, “We are over the moon with how the day turned out, it was definitely worth all the organising! To have 300+ vehicles in the end was far more than expected as we aimed for 200, but more kept coming in! “The weather was kind to us and allowed people to enjoy the great spread of vehicles, including the car awarded ‘best in show’ which was a 1916 two-cylinder Perry, which was one of the oldest cars on the day. “In total, we raised over £6,000 that will go towards funding projects in the local community. It just goes to show that having a combined event, between Westbury and Trowbridge Lions, we can raise the game and bring in more money to help people. “We were praised for our planning and organisation, with exhibitors loving the space and layout of the event. There was lots of people through the gate who also said it was fantastic considering it’s our first year! 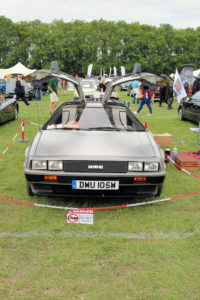 Due to the success, the clubs have set a date for next year’s event, 1st September 2019, and will plan to bring even more classic and vintage vehicles to Westbury. For more photographs of the day, taken by photographer Richard Clarke, you can view them via https://www.flickr.com/people/140086256@N06/. Also, drone footage was captured by Nick from SkyviewUK which can be seen on the Westbury Lions Club Facebook page alongside the photos. Pictures: credit Richard Clarke Photos.